Happy Entertainment - The perfect addition to your event! Kozmo the Clown - Trained in the circus arts of clowning! Also was a featured mime performer at "Seaport Village" in San Diego. Kozmo does it all Face Painting, Magic, Juggling, Balloon Animals, Mime & more! 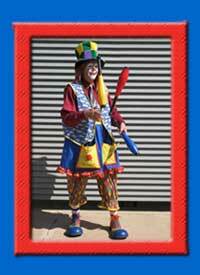 Kozmo was the stilt-walking clown for the Phoenix Suns for many years. Invite Kozmo to your next party or event for an amazing fun filled and highly entertaining comedy show with lots of audience participation. "Kozmo arrived on time, entertained the entire two hours and was an absolute smash! Kids, Seniors, Employees, and the clueless were all entertained...We look forward to working with Happy Entertainment Productions, Inc. in the very near future. Thank you for making our very first Family and Friends day a success. Please let me know if there is anything more I can do for you." 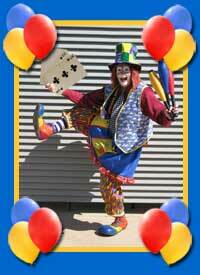 "Kozmo the Clown performed at our family's party on March 14 in Paradise Valley. This is the most entertaining clown I have ever seen! Thank you so much." "I just wanted to let y'all know how pleased we were with "Kozmo." Everyone had a great time at my son Dylon's 5th birthday party. It was a small gathering but those who attended wanted to know where we found Kozmo and we happily gave them your number." "Kozmo was absolutely FANTASTIC Saturday for our foster children's picnic. Kozmo was punctual and entertained the children of all ages. Definately the high light of our picnic. We will definately use your services again." "We would like to extend our gratitude to you and tell you what a success our picnic was due largely to that wonderful clown you sent to our picnic. We received so many good compliments. Again, thank you so much and we will certainly keep Happy Entertainment Inc. in mind for any other entertainment services we may need in the future. " "'Happy the Clown' was fabulous! She's become a regular at all of our Grand Openings. Until next time..."
"Tex the Happy Clown was very professional and a great entertainer! We will consider your company again for future events!" Willie the Clown had a great personality and was a great addition to our gathering. But, WOW, did he surprise us by belting out a beautiful song to honor our 60th Anniversary Couple! He brought both a surprise and a rousing applause to the entire party. He was quite a talent. "Roger clowned for us recently at the AT&T Spirit of America 5k Run in downtown Phoenix. He walked on stilts, juggled, amused the children (and adults, as well) and distributed balloons to the crowd. The Spirit of America 5k Run was produced in 21 cities nation wide. We at Burson-Marsteller are pleased to say that Roger provided some of the best entertainment of all 21 cities. We would be happy to contract their services for the next event in Phoenix with which we are affiliated."